Two big regions of the North Pacific Ocean are magnets for marine life, attracting a diverse array of predators in predictable seasonal patterns, according to results from the Tagging of Pacific Predators (TOPP) project published in Nature on June 22. The California Current, which flows southward along the U.S. west coast, and the North Pacific Transition Zone, a boundary between cold subarctic water and warmer subtropical water, are both hot spots for large marine predators, the study found. "These are the areas where food is most abundant, and it's all driven by high primary productivity at the base of the food chain--these areas are the grasslands of the sea," said coauthor Daniel Costa, professor of ecology and evolutionary biology at the University of California, Santa Cruz. "We tagged over 20 species--including whales, tuna, albatrosses, sharks, and turtles--and we can see where and when they overlap. This is valuable information for efforts to manage and protect critical species and ecosystems." 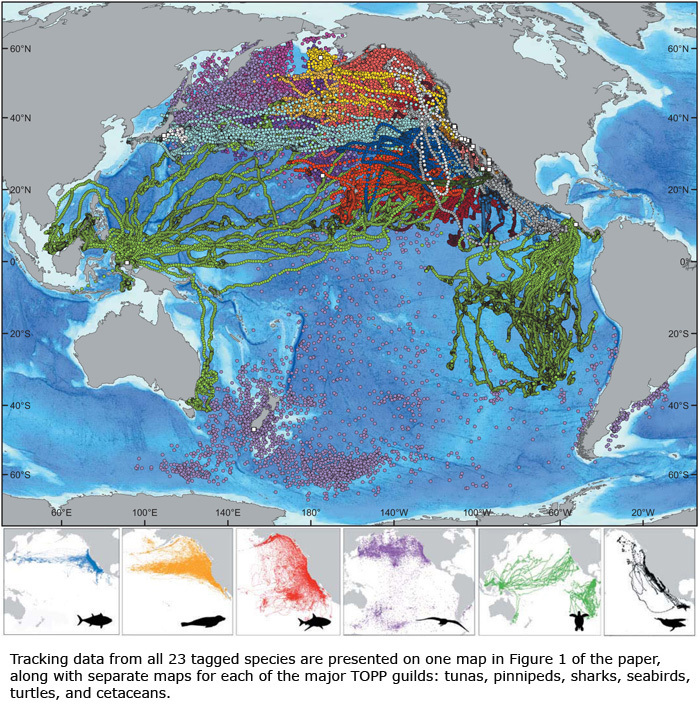 The new paper is the culmination of the TOPP program's decade-long effort to track the movements of top marine predators in the Pacific Ocean. It provides a remarkable picture of migration pathways and critical habitats for these species. TOPP was conceived by Costa and Barbara Block of Stanford University's Hopkins Marine Station. They joined with Steven Bograd of the NOAA Southwest Fisheries Science Center, Randy Kochevar of the Monterey Bay Aquarium, and others to launch the project in 2000. Although results for some individual species have been published previously, the Nature paper is the first to present the results for all 23 tagged species and look at how their migrations and habitat preferences overlap. "This is the first publication that pulls all of the pieces together in one place," said Costa, who oversaw the tracking of marine mammals, birds, and turtles. "We brought together a large team of investigators to study diverse species and look at how these organisms use the ocean. It was unprecedented to examine so many species over such a large scale." The study used a variety of technologies to track the movements of different species. 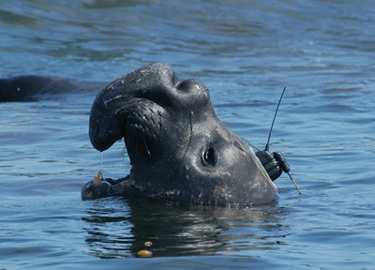 Sophisticated electronic tagging devices were developed to enable detailed tracking of each animal's location, as well as environmental variables such as water temperature, salinity, and depth. Altogether, the project deployed 4,306 electronic tags on the 23 species, yielding a huge amount of data for the team to analyze. The results suggest that water temperature may play a key role in driving the seasonal migrations of many species. This was particularly evident in the large marine ecosystem defined by the California Current, where cool, nutrient-rich water moves south along the coast. Correlations between animal movements and satellite measurements of sea surface temperatures suggest that seasonal warming in the south may trigger northward migration of many predator populations, while cooler temperatures in the north trigger southward migrations. This work is a first step toward using satellite observations of ocean conditions to predict where these large predators will be. 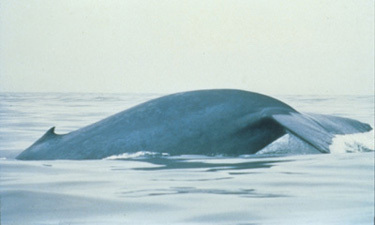 The ability to predict the areas that animals are using in the vast Pacific basin was the goal of the TOPP project when it was begun in 2000, and it remains one of the most important aspects of the team's ongoing research. "By knowing where animals are we can better manage the resources and their futures," Block said. "The ability to observe ocean conditions and predict where individual species are likely to be is fundamental to the concept of ecosystem-based management." Many predators spend their whole lives within the California Current, but others migrate vast distances across the Pacific Ocean to reach its rich waters, which support abundant populations of prey such as krill, sardines, anchovies, and squid. Tagged animals that migrated to the California Current included leatherback turtles from Papua New Guinea, shearwaters from New Zealand, and tuna and loggerhead turtles from Japan. "It's an incredibly important feature--animals keep coming back to it, and some, like California sea lions, live entirely within the California Current," Costa said. The other hot spot is the North Pacific Transition Zone (NPTZ), which extends across the North Pacific from Japan to Washington state. It is like a weather front in the ocean, where warm and cool masses of water meet and mix. 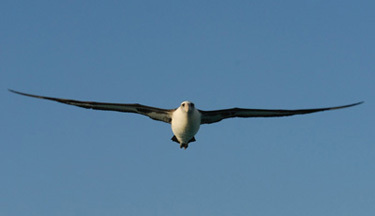 The NPTZ serves as an east-west migration corridor and foraging region for elephant seals, sharks, albatrosses, tuna, and other predators. The researchers also used tracking data to examine the partitioning of habitats by closely related species. Different species of tuna, for example, prefer different water temperatures, and these preferences correlate with physiological differences between the species. In addition to developing new tracking technologies and techniques, the researchers had to manage large datasets and synthesize different kinds of data for the final analyses. A team of researchers from Dalhousie University in Halifax, Canada, played an important role in data analysis. "The number of coauthors represents the complexity of working with multiple species, multiple tools, and large datasets," Costa said. In addition to Block and Costa, the coauthors include Ian Jonsen, Arlis Winship, and Greg Breed of Dalhousie University; Salvador Jorgensen, James Ganong, Alan Swithenbank, and Mike Castleton of Stanford University; Scott Shaffer of San Jose State University; Steven Bograd, Elliott Hazen, Dave Foley, Heidi Dewar, and Scott Benson of the NOAA Southwest Fisheries Science Center; Autumn-Lynn Harrison, Michael Weise, and Bill Henry of UC Santa Cruz; Bruce Mate of Oregon State University; and Kurt Schaefer of the Inter-American Tropical Tuna Commission. TOPP is one of 17 projects of the Census of Marine Life, an ambitious 10-year, 80-nation endeavor to assess and explain the diversity and abundance of life in the oceans. Funding for TOPP was provided by the Sloan, Packard, and Moore Foundations, with additional support from the Office of Naval Research, NOAA, the Marine Life JIP-OPG, and the Monterey Bay Aquarium Foundation.